Boise State Broncos linebacker Curtis Weaver (99) tips a pass from Fresno State Bulldogs quarterback Marcus McMaryion (6) during the first half at Albertsons Stadium. 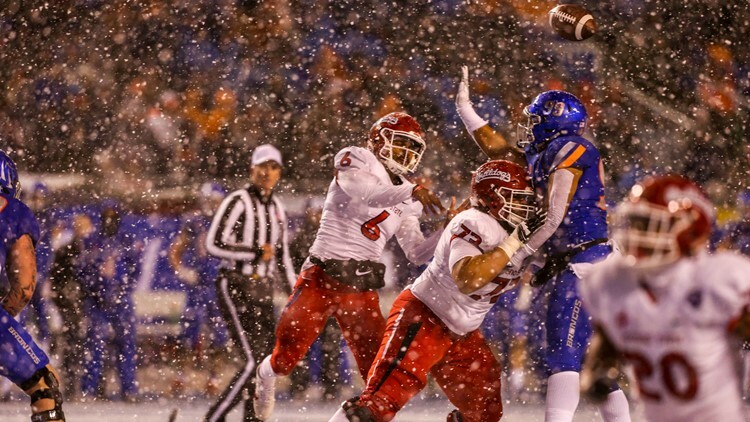 Boise State is favored by three points—again. The point spread for the First Responder Bowl December 26 in Dallas is: Broncos by three over Boston College. They’ve been a three-point favorite at one time or another each of the past two weeks and ended up with a win over Utah State and a loss to Fresno State. One issue for BC is the departure of offensive coordinator Scot Loeffler to Bowling Green to become head coach. When you check out Eagles highlights on offense this season, you’ll see a lot of creative play-calling. How will that be affected on the Cotton Bowl field? Boise State, of course, is coming off a 16-point night in the Mountain West championship game. Tom Fornelli of CBSSports.com ranks all 39 bowl games, though, and has the First Responder all the way up at No. 6. To say Jeremy McNichols has been well-traveled in the last year and a half is an understatement. McNichols was signed to the Tennessee Titans active roster off the Denver practice squad yesterday. Hopefully he’ll get to add to his career stats—two carries for four yards earlier this fall for Indianapolis. This will be McNichols’ fifth NFL team since being drafted by Tampa Bay in the fifth round out of Boise State in 2017. After being released by the Buccaneers just before last season, he split time between San Francisco’s practice squad and active roster. He lasted until the end of this summer’s training camp with the 49ers, then was picked up by the Colts and ultimately by the Broncos. Meanwhile, former Boise State standout Rees Odhiambo has been signed off Indy’s practice squad by the Arizona Cardinals. Nevada is coming off its two highest-quality wins of the men’s hoops season so far—79-65 at Loyola Chicago and 73-61 at USC. Nevertheless, the 8-0 Wolf Pack fell one spot in the AP Poll yesterday, falling to No. 6 after being leapfrogged by Michigan. The Pack stays No. 6 in the Coaches Poll. Nevada has a chance to make some more noise Friday night, though, when it hosts No. 20 Arizona State at Lawlor Events Center. Sunday afternoon brings an interesting matchup—the Wolf Pack hosts Grand Canyon, which held off Boise State 69-67 Saturday night in Phoenix. Could be a trap game in Reno. As for the Broncos, they’re off until this Saturday night versus Central Washington. Elsewhere, College of Idaho absorbed an 80-52 exhibition loss at Montana last night. One guy who liked Chandler Hutchison a lot going into the NBA Draft last spring is gone, as the Chicago Bulls fired coach Fred Hoiberg yesterday following a 5-19 start. Associate head coach Jim Boylen has been promoted to head coach (not just interim). Hoiberg was in his fourth season since leaving Iowa State to take his first NBA job. The Bulls have lost six straight games and 10 of their past 11. Hutchison is in a bit of a slump. The former Boise State star has scored just two points in each of the last three games, going a combined 3-for-10 from the field (although he is still rebounding well). Boylen is a 20-year veteran of NBA coaching staffs, but this is his first time as a head man. He led the Utah Utes program for four seasons from 2007-11. This is a big night for former WAC commissioner and one-time Boise State baseball player Karl Benson, who will be honored with one of the National Football Federation’s 2018 Legacy Awards at the 61st NFF Awards Dinner in New York. Benson is retiring next June as commissioner of the Sun Belt, capping a 28-year run as commish of three different conferences. The NFF credits Benson with having “reinvigorated the league under the ‘Together We Rise’ brand” while adding six new schools to the Sun Belt, creating a football championship game, securing three new bowl tie-ins and arranging a partnership with ESPN. Benson received his bachelor's degree from Boise State in 1975. Greg Patton may have retired as Boise State men’s tennis coach, but he’s still guiding young players to the mountaintop. Patton coached a collegiate Team USA again this year in the Master's U International Team Championships in Grenoble, France. And the Americans beat Great Britain 4-1 Sunday in the finals to win their eighth title in the past 10 years. The USA squad was made up of top collegians from all over the country. Oh, and his assistant coaches were Amanda Augustus of Cal…and Garrett Patton of Cal Poly. That latter guy is the General’s son who played for him as a Bronco and earlier starred at Boise High. Oklahoma State’s Barry Sanders wins the Heisman Trophy just before wrapping up a record-setting season that sees him break Marcus Allen’s single-season rushing record with 2,638 yards. Sanders also scored a record 39 touchdowns that season. Boise State’s Brock Forsey moved into second on the all-time list with his 32 TDs as a senior in 2002—he was surpassed by Wisconsin’s Montee Ball, who scored 34 touchdowns in 2011.